Niagara Falls has to be one of the most popular Bucket List destinations in all the world. There are lost tribes living in the Amazon, with absolutely no links to the outside world, that have Niagara Falls on their Bucket List. I count myself very lucky to live these days within two hours of these iconic waterfalls, and never tire of visiting them. And the best view in the house is from the decks of the Maid of the Mist. Last Tuesday, Rich, Sue and I played hooky from work and headed down to Niagara Falls. 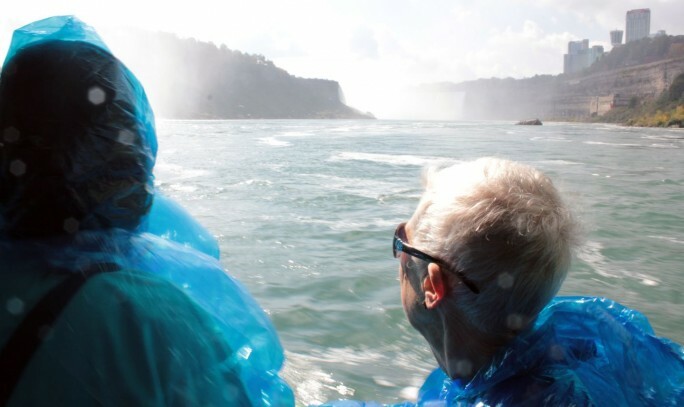 We’d decided that, if the rumours turn out to be true, we wanted to Journey with the Maid of the Mist one last time, before she sails off into the history books at the end of this month. 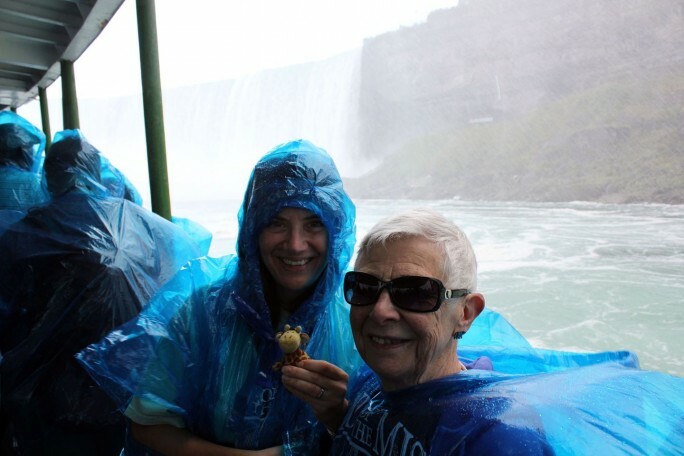 Besides, my friend Penny (Sue’s mum) had never experienced the thrill of the Maid of the Mist, despite living in southern Ontario for 50 of her 80 years, including two years in Niagara Falls itself! 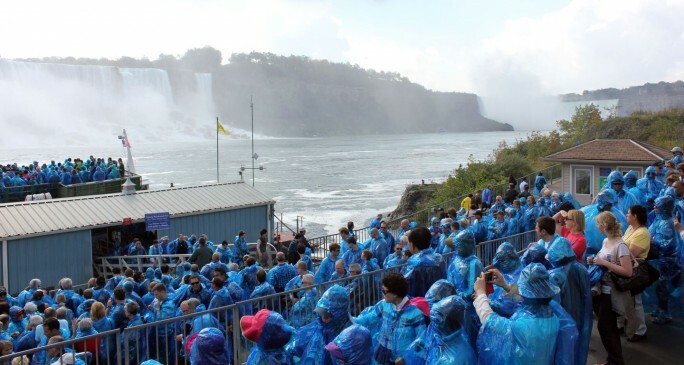 We concluded this simply wasn’t acceptable, and Penny had to correct this oversight aboard the original Maid of the Mist… before it was too late. We awoke on Tuesday to the sound of rain on the roof and worried that, with half a century from which to choose, Penny had picked the wrong day. Thankfully, by the time we reached the Falls it had become a glorious, sunny, warm, autumn morning. With it being so late in the season, the line-ups were mercifully short. 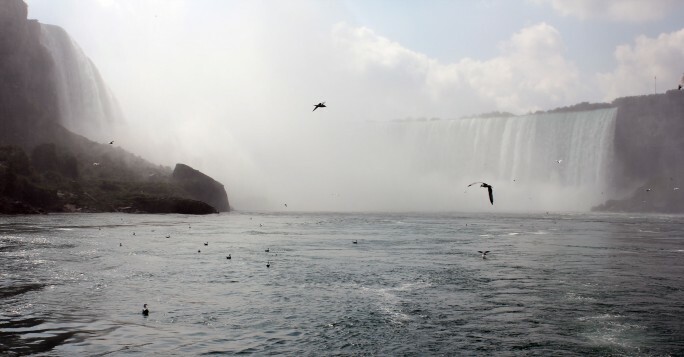 Within just 20 minutes of our arrival, we were standing on the deck of our boat, Maid of the Mist IV. The gangplank was raised and we slowly pulled away from Canada, heading towards the American Falls. At some point we crossed the invisible boundary between the two nations, but I doubt anyone realised. We were all too mesmerised by the wall of water rapidly rising (or should that be falling?) above us, although the great pile of rock debris at its foot prevented our Maid getting too close. The American Falls are incredible in their own right. In any other context, they alone would draw awe-struck visitors from far and wide. Yet at Niagara Falls they’re something of a supporting act. A slightly shabby, poorer (or should that be pourer?) relative, overshadowed by the spectacular Canadian Falls. Leaving the American Falls in our churned-up wake, we slowly chugged up the river towards the main event. 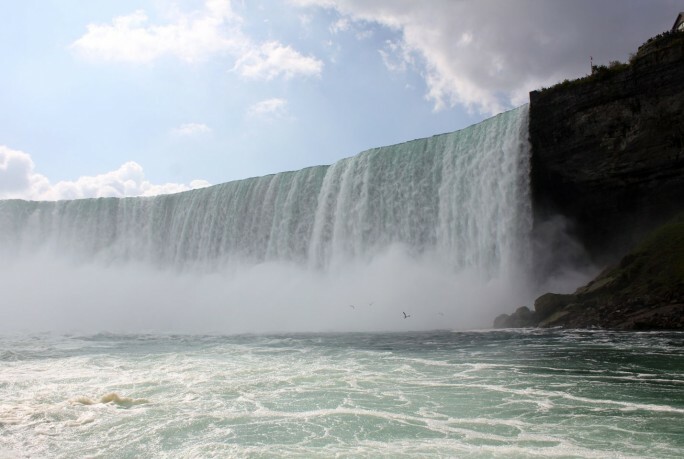 Through boiling eddies, Maid #IV gallantly fought her way into the arms of the Canadian Falls. Little by little, those arms enveloped us, as our boat struggled against the vicious current. Breathtaking is perhaps an overused term, but there really is no other word that properly describes standing on the decks of what is essentially a tiny metal cork bobbing about inside the turbulent heart of the Canadian Falls. The little boat needs all its considerable strength just to stay still amidst the swirling, tugging current. And the billowing mists catch your breath as you laugh for the joy of it. It’s simply breathtaking. Literally. Within the tumultuous confines of the towering arc of that colossal, never-ending curtain of water, how can you feel anything but tiny and insignificant? How can you not be beyond impressed? There’s a boat in there somewhere! One second you’re enveloped by spray. All you can see is the boat on which you’re standing, surrounded by a few feet of whipped-up river. All you can hear is the thunder of the falls, coming from every direction. Then a gust of wind drags away the veil of mist and you find yourself at the centre of the most awe-inspiring natural amphitheatre. It encircles and dwarfs you. And still you’re surrounded (and penetrated) by the rumbling roar of the falls. And then it was all over. Maid of the Mist IV turned her bows away from the wall of water, and like a stone from a sling shot, was propelled rapidly downstream, out of the soaring, spray-filled, horseshoe of falling water and back into the sunshine. As the entire boat chattered excitedly around us, I asked Penny what she thought of her latest adventure. 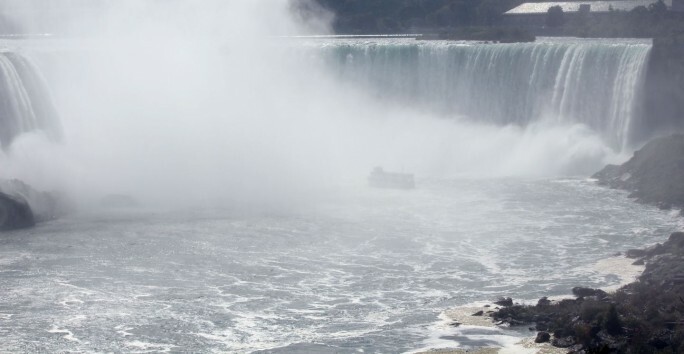 And as for the rumours concerning the Maid of the Mist’s untimely demise? Well, during our visit to Niagara Falls I discovered this is only half true. If you’re interested in learning the full story, pop over and read Farewell, Maid of the Mist? on my own blog, Jaspa’s Journal. I hope you enjoyed this post. My name is Jaspa, and I’m the main character in the Jaspa’s Journey adventure novels by Rich Meyrick. To learn more visit my website, www.jaspasjourney.com, and blog, Jaspa’s Journal, or follow me on Facebook and Twitter. PS. 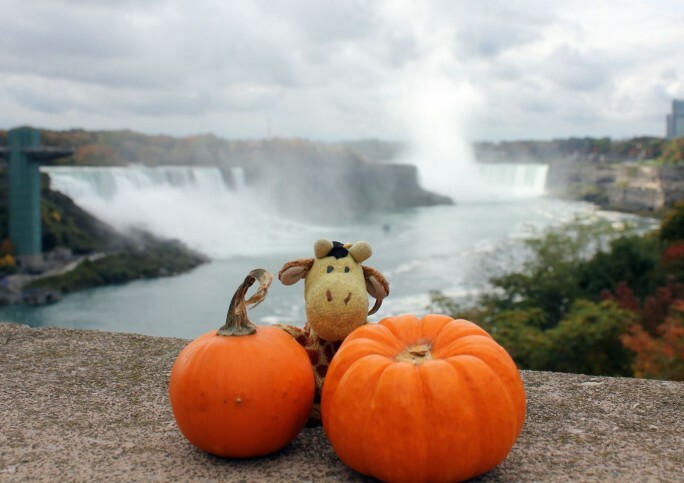 Happy Canadian Thanksgiving to all of Bucket List’s readers north of the border! 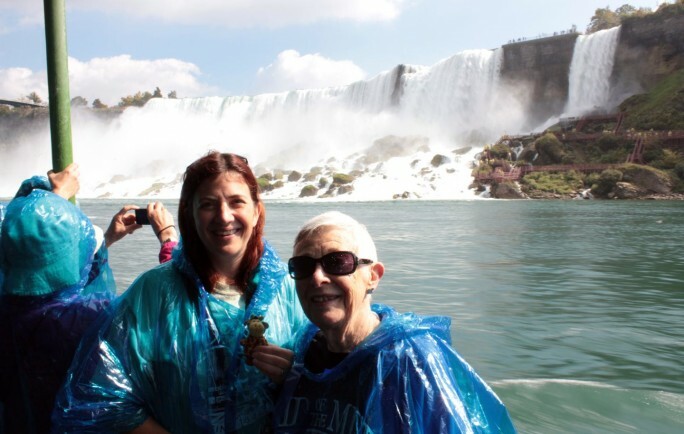 The Maid of the Mist is absolutely a *must do* in Niagara Falls! The views are spectacular no matter where you’re at, but nothing beats the thrill of being *in* it, nothing between you and the mist but a thin blue raincoat. If you want to be ‘in’ it, have you tried the Whirlpool Jetboat, Heather? No, I’ve never tried the jetboat! Well, looks like I have an excuse to visit Niagara Falls again!